My late brother Abdul Rasheed told me over the telephone in 1988, that just past the age of 50, he suddenly developed the ability of writing poetry. Our maternal grandfather, Bodufenvalugey Seedi was one of the most celebrated of Maldive poets of the twentieth century and Abdul Rasheed felt that he might have inherited the poetic gene from Grandfather. Abdul Rasheed compiled an anthology of his poems and miscellaneous verses, in English and Maldivian, in 1991 with the intention of publishing it with annotations for American readers, but he died before he realised this goal. This is an attempt on my part to help him realise that goal posthumously. All of his English and Maldivian poetry that he sent me is here. Some of this does not feature in his light, unpublished booklet entitled Poems and Raivaru, copies of which, some people may still have. Abdul Rasheed was born on 16 October 1932, in Malé, in the Maldives, the second of my parents' seven children. He left the Maldives to study abroad at the age of 14, and spent his entire working life in Canada and the United States. He specialised in obstetrics and gynaecology and had a working interest in the use of hypnotism in childbirth. He held a doctorate of philosophy in hypnotism the first Maldives-born person to be admitted to the degree of doctor of philosophy. He was also the first Maldives-born person to qualify as a medical doctor in the Western tradition. Although medicine was his first love, Abdul Rasheed was a musician, a poet, a published author, and an artist in watercolours and sketches. He was married to Suzanne without children. They both adored cats. As a child Abdul Rasheed was a handful and as a result had to be frequently sent to our maternal grandfather�s residence, Bodufenvaluge. Grandfather, who was a celebrated poet, apparently had an important influence on Abdul Rasheed�s early life. Abdul Rasheed�s first schooling was at Sanniyya School Boys� Division (later renamed Majeediyya School) in Malé, where he was head boy and did exceptionally well academically. In 1946, Abdul Rasheed was sent to Colombo in Sri Lanka to join our eldest brother Abdul Razzak who had been at school there since 1942. He was admitted to a hostel called Sosun Villa run by the Maldives government from where he attended St Peter�s College, a reputable Catholic school. While he was at school in Colombo, he returned to Malé in 1951 for 3 weeks, 1953 for 4 weeks, and 1956 for 3 weeks. In 1958, he proceeded to Madras Medical College in India to study medicine, graduated with the degree of Bachelor of Medicine and Bachelor of Surgery, and finished his residency in 1965. He returned to Malé in 1965 for a week before proceeding to Canada on a World Health Organisation fellowship that he obtained himself. He specialised as an obstetrician and gynaecologist in Canada where he completed residencies at Ottawa General Hospital in Ottawa Ontario, Henderson General Hospital in Hamilton Ontario and St Joseph�s Hospital in London Ontario. He completed his doctorate of philosophy in hypnotism, from Colombia Pacific Hospital in San Rafael, California. He met his wife Suzanne in Canada. 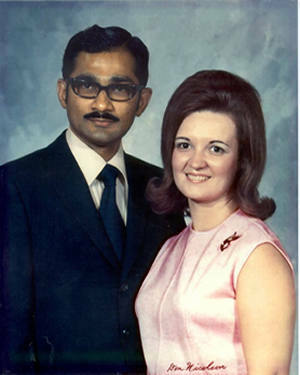 Abdul Rasheed and Suzanne were married at a registry office in London Ontario, Canada on 8 October 1970. He took up Canadian nationality and he and Suzanne subsequently moved to South Haven in Michigan, United States in 1976. Abdul Rasheed practised in the South Haven area of Michigan, where he provided medical services to many patients and delivered almost 2000 babies between 1976 and 1992. Suzanne Bergey was born in Brantford Canada on 4 October 1938, of Pennsylvania Dutch ancestry. Of her early life, I know little. I am the only member of our family who never met her, but she often spoke to me at length over the telephone. She came across as a very bubbly and pleasant person. Suzanne visited the Maldives by herself in 1989 and Suzanne of the Lakes Meet was a poem that Abdul Rasheed composed for the occasion. She took her husband to the Maldives for his last visit in 1990. Suzanne died in October 1991 of cancer and left her husband absolutely heat-broken. For You I Weep was a poem Abdul Rasheed composed to mourn his beloved Suzanne. In keeping with her wishes, Suzanne was buried in her native Canada. Her only surviving blood relative was a niece. Just after Suzanne died I started noticing that Abdul Rasheed cleared his throat quite frequently when he spoke to me over the telephone. When I asked him what the matter was, he brushed aside my concerns by quoting an old Maldive saying which translates as: "a carpenter�s house seldom has a door". He was a physician and was implying that physicians may be concerned more with others� health than their own. Abdul Rasheed died eleven months later, on 30 September 1992, and was buried in McDowell Cemetery in South Haven, Michigan. A plaque honouring him was placed in the then newly remodelled obstetrical unit at South Haven Hospital. The following is an article written by staff writer Anne Brown of the Michigan newspaper Tribune. Abdul Rasheed�s work had featured on national television in the United States of America. SOUTH HAVEN: He used to be afraid people would think he was "a kook from the East who practised voodoo." Now Dr Abdul Rasheed, M.D. Ph.D., an obstetrician-gynaecologist at South haven Community Hospital, has pregnant patients begging for his speciality. And he does it all not with shiny coins or pendulating pocket watches but by talking to his patients and training them in the art of relaxation. For years hypnosis was thought of as a type of magic and scientists still regard it as a mystery. Even Rasheed doesn�t fully understand it. "THAT�S A big question. If I tell you the mechanism I should get a Nobel prize," he said. "We don�t know how it works but we know how to use it." Rasheed explained that the hypnotic state is one of the brain�s altered states that include sleep, unconsciousness and coma. "In the hypnotic state the mind is more concentrated and is free from distraction," Rasheed said, "and you will be completely relaxed, physically and mentally, - even more relaxed than in sleep." Another characteristic of the hypnotic state is the active role the subconscious mind plays creating a high level of suggestibility. This is the state that Rasheed aims for so he can "suggest" to his patients that they will have a relaxed and painless labour. RASHEED BECAME interested in hypnosis when he was in medical school in Canada but didn�t practise it until he came to South haven in 1976. Then he was asked by a patient from Chicago who had her first baby by hypnosis to help her use it again. Rasheed said after her experience word spread quickly through South Haven. The process takes place in three relaxation sessions during which time his patients learn by listening to tapes to hypnotise themselves. During the first meeting, Relaxation I, Rasheed gives the first relaxation method and discusses that as a natural function of the body, pregnancy should not be painful. "ITS DEPROGMAMMING and reprogramming." He said. The bottom line is pregnancy, labour and delivery are normal processes of the human body and all normal functions are performed normally without pain providing they are prepared. In Relaxation II, Rasheed urges his patients to highlight the positive aspects and disregard any notions of pain. That is why those listening to the relaxation tapes will never hear the word pain. Rasheed also tells his patients to think of positive things between the contractions, such as walking along the beach or watching a winter scene. By the time Relaxation III rolls around, Rasheed�s patients know how to relax themselves through self-hypnosis. According to Rasheed, when his patients begin labour the whole process comes together in a cumulative effect � and works. �THEY DO SO well that the nursing staff at once recognises my patients that have gone through the relaxation," he said. One of Rasheed�s patients, Barb Rumiez of South haven said the relaxation training kept her two deliveries "pretty much painless. The first time I didn�t even know I was in labour, I just felt some pain in my back and by the time I got to the hospital I was dilated," she said. One of Rumiez�s deliveries lasted 45 minutes and the other, a breach, lasted one hour. This anthology includes the English poems and verses that Abdul Rasheed compiled in 1991, at the urging of Ambassador Sikkagey Hussain Manikfan of the Republic of the Maldives. I have also included other poems that he had omitted from his anthology for various reasons. Where necessary I have inserted annotations (labelled Author's Annotations) for readers without a background of pre-1950�s Maldives. That period, of course, was a very long time before my time (I arrived on the scene very late and remain very much a timeless "youth"! ), but I have done the necessary research. I have regrouped the poems. Abdul Rasheed visited the Maldives in the New Year period of 1989-90 after being away twenty-five years. This was his first visit in twenty five years. About a year earlier, he wrote in an epic "letter" to me dated 7 January 1989, that: " the following is what I would like to call a �Potpourri of Poetry�. Here you will find a mixture of short verses. Some of them are meant to be humorous. In others, one might detect a Sufic flair, with more than one meaning. Such verses usually convey a universal truth, and thus remain eternally valid and relevant, in spite of changing circumstances in our lives." That could embrace anything within reach. Like music, poetry expresses one�s feelings on sentiments and moods. Most languages have rules and conventional methods for writing poetry. However these have often been ignored even by such giants in the field as William Shakespeare. This is not surprising, for how could rigid, man-made rules always control the means of expressing spontaneous and emotional states like happiness, sorrow, or inspiration? In the English language, the so-called "free verse", which are very popular nowadays, allow more flexibility for their composition. I am not sure whether or not such a thing exists in the Maldivian Language. However, a considerable number of Raivaru and other forms of poetry in Divehi appear to be structured outside the norms prescribed by the old Pundits of our poetry. This is a consolation for me since my poems often deviate from the strictly conventional styles. I don�t claim to be a "POET" � I am still a mere amateur and a novice in the field, with no formal training. And if at all the old saying that "poets are born, not made" is true, then I regret very much for not having tried my hands at poetry much earlier. Am I possessed by the Spirit of a Poet? "How do you get your verses rhyming like these?" It comes to me with ease." My raivaru are a still more recent product. The first of them was written about two years ago, soon after I had decided to visit the Maldives, after being away for many long years. The raivaru given here hopefully indicate the trend of my thoughts, at the time, and my feelings and experiences during that trip. It has been a gratifying experience for me to finally compile these verses (both English and Maldivian) into a booklet. Thanks to a request of Ambassador Hussain Manikfan of the Republic of Maldives at the United Nations, for a copy of my poems. If not for that request, they would still have remained in their loose-leaf state.